This is by far the darkest piece of Indian fiction I've picked up for a while. A paranormal thriller with thrills and chills galore, it has that peculiarly Indian feel to it. The author doesn't seem to want to come out publicly, simply going by the nickname 'Adi', obviously the short for 'Aditya', an everyday Indian name. 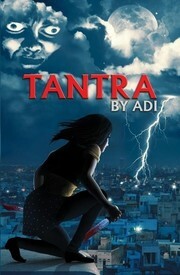 Anu, the main characater, is a young woman who can look after herself. Recently arrived in Delhi from New York, she's no sheltered Indian princess. She's walked on the wild side since she was young, having the unique gifts and training which make her a vampire hunter. She stalks the night in black leather with an impressive array of weapons hidden about her person, not to mention the ability to shift and give chase across rooftops in the dead of the night. But now, the East/West culture shock kicks in. Her aunt insists she do the 'dekhan dekhai' custom like a good Indian girl and meet eligible young men from 'good' families (whatever 'good' means), with a view to settling down. The heat is too much. She's forced to ditch the black leather in favour of black kurta pyjamas. What's even stranger, is the fact that in India, the lines between good and bad are blurred. Back in New York, the vampires were the bad guys and always the target. In India, things are slightly different. The vampire hunters and vampires are inclined to do deals here, being very often on the same side. I'm not sure if that's so strange. As a reader who occasionally reads paranormal, I'm familiar with the tortured vampire hero who isn't bad at heart but who tries to keep his need to feed limited to preying on the scum of the earth, the wicked, underworld members of society who prey on innocents. But for Anu, it's something of a culture shock. The common enemy of the vampire hunters and vampires is a seemingly innocuous guru, Baba Senaka, who runs an ashram in Delhi and who is a brand in himself.. Anu senses the evil atmosphere emanating from the Baba's ashram. While investigating a spate of kidnapped and murdered children, all clues lead the Baba. Is the revered guru is actually a practising tantrik underneath, someone who use the black arts for his own aggrandisement? Anu goes into training under the watchful eye of a couple of experts, learning sattvic mantras and exercises to counteract the evil influence of the Baba as vampires and hunters alike gather for the final showdown just before the Holi festival, when pure psychic power permeates the atmosphere. There are enigmatic characters aplenty. Anu, one senses, is one step away from turning rogue. Although she's clearly on the side of the good and the innocent, she has scores to settle. Her lover in New York was murdered and as she was able to trace his killer back to Delhi, this is what motivated her to return to her place of origin. The powers who control the vampire hunters would clearly not approve of her using her skills for revenge so she keeps quiet. There's Amit, the Indian vampire hunter who is fully aware that the dangerous nature of his work means that he will never live out his lifespan. There's Chandra, the charismatic commander of the vampires who has lived longer than any of them. Pandit Grover, Dr. Sharma and the enigmatic Karta, powerful, psychic characters who inspire and encourage Anu as she readies herself for the confrontation with the naked power of evil. What does it mean when all the questions are not answered at the end of a story? It means you have to wait for the second part. So that's what I'm doing now. I'm waiting for Part II of this dark and fascinating tale. I want to know who killed Anu's lover. Will Anu become Chandra's lady or will she get with Gaurav, a young man who attracted her since she arrived in Delhi? I shall never think of Delhi in quite the same way again. City of tombs? Indeed!